Helical piles are a factory-manufactured steel foundation support system for structures that have been assessed to have poor supporting soils. The terms "helical piles", "screw piles", "helical anchors", "helix piers", and "helix anchors" are often used interchangeably. However, the term "pier" most commonly refers to a helical pile loaded in axial compression, while the term "anchor" generally refers to a helical pile loaded in axial tension. Helical piles consist of a round central shaft and one or more helix-shaped bearing plates, or blades, which are welded to the lead section. Extension shafts, which may or may not include additional helix plates, are used to extend the pile down into competent load-bearing strata and to achieve design depth and capacity. 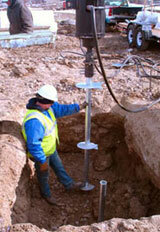 Using the application of torque, helical piles can be "screwed", or advanced, to competent load-bearing strata. Once design depth and capacity have been achieved, brackets are used at the tops of the piles for attachment to the structure. 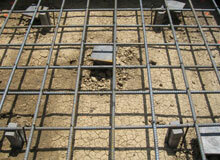 Concrete footings and structural slabs can be formed and poured immediately following the pile installation. Call or e-mail us today for a free on-site inspection and written quote for a helical pile installation. We serve Montreal, Laval, Drummondville, Granby, and Saint-Hyacinthe and the surrounding areas in Quebec. Helical piles are superior to many other new construction structural reinforcement methods. The rigid three-bolt coupling which connects helical lead sections and extensions makes the pile resistant to bending, unlike the pin and bolt coupling found in square-shaft helical pile solutions. Additionally, the greater section modulus of a round-shaft helical pile can resist buckling or twisting of the shaft at higher torque values than a square-shaft helical pile. Inexpensive mobilization costs, the ability to install in areas of limited access, and a vibration-free installation make the Supportworks' helical pile system an ideal choice over geo-piers or auger-cast piles. The Supportworks helical pile system, available in Montreal, Laval, Drummondville, Granby, and Saint-Hyacinthe installs quickly, is cost-competitive, and is available with optional hot-dip galvanizing for added corrosion protection. 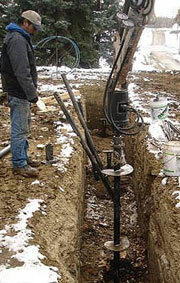 Few people may realize that the application of helical piles at construction sites dates back almost 200 years. Contractors in England were using an early version of today's helical foundation pile systems as far back as the 1830s for moorings and lighthouse foundations. Today, helical piles have worldwide acceptance as an effective solution in the construction industry and engineering community. In 2007, the International Code Council Evaluation Service, Inc. (ICC-ES) approved AC358, Acceptance Criteria for Helical Foundation Systems and Devices. 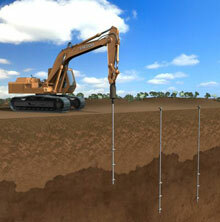 Helical piles are also now included in the 2009 International Building Code. Supportworks' research and development team has tested their deep foundation systems at independent laboratories, and when required, at independent laboratories accredited by the International Accreditation Service (IAS) to perform product-specific testing. Systèmes Sous-sol Québec of Quebec is a provider of the Supportworks Helical Pile System in Montreal, Laval, and the surrounding areas. We can offer Free Estimates, inspections, and quotes to all contractors interested in deep foundation solutions for new construction on unsuitable or questionable soils. The Supportworks Helical Pile System, provided by Systèmes Sous-sol Québec of Montreal, is superior in the marketplace, engineered to perform, and properly tested in accordance with documented standards and criteria. For a free estimation and price quote for new construction helical piles in Montreal, Laval, Drummondville, Granby, Saint-Hyacinthe and elsewhere in Quebec, call or e-mail Systèmes Sous-sol Québec today. All estimates include an on-site consultation, and each completed contract includes full written warranties on installed products.